25 November 2007 (Thanh Nien News) – Anyone visiting the imperial city of Hue shouldn’t miss a trip to the The Mieu temple, where these nine royal urns are displayed. The urns, one cast for each of the Nguyen kings (1802-1945), represent the pinnacle of bronze casting technology – and we know that the region of Vietnam has been home to a bronze casting tradition that dates thousands of years! 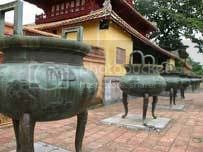 Any visit to Hue must include a trip to the amazing imperial urns of the Nguyen kings located in the old imperial city. These urns will give you a sample of the impressive bronze casting technology of that era, as well as a taste of Vietnam during the dynamic Nguyen dynasty (1802-1945). In 1802, Nguyen Anh took the throne and became Emperor Gia Long, founding the Nguyen dynasty that was to reign from Hue until 1945. In their 143-year rule, the Nguyen kings ordered the construction of a system of citadels, royal palaces, mausoleums, temples and pagodas, as well as houses with gardens that served as kings’ and mandarins’ residences in Hue and neighboring areas. Among the particularly impressive architectural accomplishments are the nine imperial bronze urns, known in Vietnamese as Cuu Dinh, standing in front of The Mieu Temple dedicated to 10 of the 13 Nguyen kings. You can read more about the royal urns of Hue here. The reliefs of the urns describe the country of Vietnam, taking note of geographical features, along with flora and fauna of the country during the reign of the Nguyen kings. The city of Hue is a UNESCO World Heritage Site and worth a visit by itself. Find more books at the SEAArch bookstore.